People to call to catch a snake You never need to feel like you have to handle a snake situation on your own. Snakes can be dangerous even if they aren’t venomous. A snake bite can lead to serious secondary infection, and the most common way people get bit is from trying to kill or handle a snake. If you have a snake in your home or on your property that needs to be removed, do not hesitate to call in a professional. There are a number of resources to locate someone in your area. The Internet has national directories, and if you really needed to, you could call your local police station and they could refer you to an expert. Many cities and towns where venomous snakes are common have special wildlife units that can handle nuisance issues. Smaller towns will need to find a private contractor to take care of the issue. When the professional arrives, he or she will assess your situation. Not only will they make recommendations about removing the snake, they will make recommendations on how to prevent snakes from being a constant issue in your yard. Hiring a professional is always a good idea, especially if you can’t tell if the snake is venomous or not. How to get rid of snakes from your property It is not difficult to get rid of snakes on your property, in the water or in your yard. All it takes is a dedication to property management and knowledge of snake behavior. The best way to get rid of snakes is to make sure they don’t want to be around your house in the first place. Snakes will look for places where food and shelter are abundant. Look around your home and property for things that will encourage snakes to stay. First, keep your vegetation to a minimum, especially near your home. This does not mean just wedding your garden. Snakes love long grass. 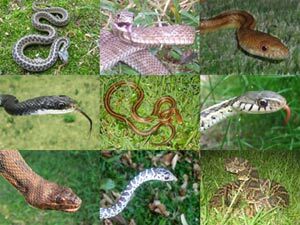 Leaving your yard un-mowed for too long will result in overpopulation of snakes and other critters. If your grass is too long, snakes can slither their way into your gardens. Now, not only will you have to manage your overgrown yard, you have to keep your garden free of groundcover and thick plants. A lot of vegetation is not the only factor that will draw snakes into your yard. Too much debris, like run-down sheds and wood piles, will provide snakes with excellent places to den. Not only are debris piles problematic, common yard structures, like patio rocks and stone walls will also be ideal places for snakes to live. 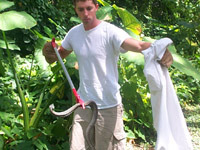 Removing snakes Removing snakes by hand is not a difficult task under normal circumstances. 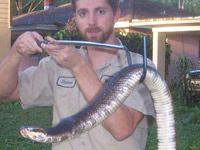 Nonvenomous snakes can be handled while wearing gloves or by using a snake hook. You can easily craft a snake hook by bending the end of a long pole. Remember to round the edges; you do not want to hurt the snake. Because serpents do all sorts of good things for the environment, safe capture and relocation is always ideal. Removing snakes means removing the things in your yard they like. Standing water draws in snakes. If you can do without the decorative ponds it will be in your best interests. Not only does standing water provide something for a snake to drink, it will be a constant food source of insects and amphibians. Tall grass is also a no-no. Homes with short lawns have fewer snake sighting than homes with taller grass. This should not be surprising. Snakes want to be cool in the heat of the day. They also want to be hidden from predators and prey. Your grass does not have to be very tall to hide a snake. If a snake can maneuver through your yard without much resistance, it can access the areas closer to your home. 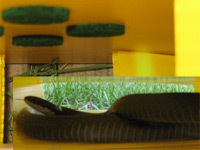 Snakes that are living in gardens or under patios can be trapped using a snake glue trap. A glue trap will hold the animal in place until it can be released in a new location. See more Florida snake photos. 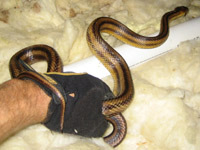 How to get rid of snakes under a house When snakes are under a house or building, getting rid of them becomes much more difficult. The best way to catch a snake, short of hiring a professional to do the job for you, would be to purchase some snake traps and set them up in the area where the snakes are usually seen. If you can pinpoint the den hole, that will be the location for your traps. Because we don’t want to kill snakes, glue traps are one of the most effective ways to remove the animals from a property. The snake will be drawn into the box after the scent lures on the inside. Once inside, the serpent will become fixed to the glue pad. This glue will keep the snake inside the box until you are able to relocate it. Do not leave glue traps unattended for days. If a snake is trapped inside, you will want to release that animal as soon as possible. Spray some cooking oil on the glue pad and wait for the snake to work itself free. The animal will be completely unharmed during the process. When all of the snakes have been trapped, make sure you fill in any areas around the home that could let snakes inside.